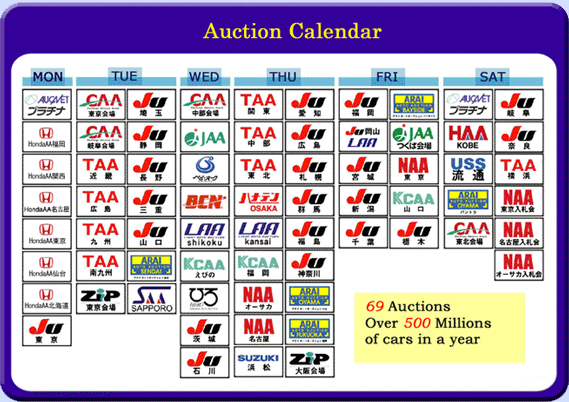 We have memberships in 69 auto auctions, which offer 512million vehicles in a year. Their auction sheets and inspection standards are similar but slightly different. 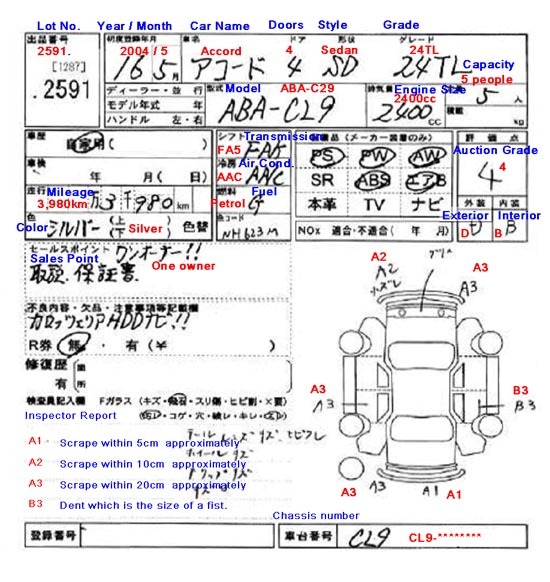 We would like to present an example auction sheet and grade standards of JU Auto Auction. Please use it as a reference in your purchasing process. Auction Grade, Exterior, and Interior are evaluated by the inspection standards below. Most used vehicles in auction fall into the grade range from 6 to A or X. As good as new. Exterior and interior are in immaculate condition. A car that has been repaired slightly and the repair is in very good condition. A car that has been repaired slightly and the repair is in good condition. Inconspicuous scratches or dents. A car in a good condition but has a few scratches or dents. A car that has some scratches or dents. Repair for scratches, dents, or paint stains may be needed. A car that has scratches or dents. Repair for scratches, dents, or paint stains may be needed. A car that has been repaired and the repair is not in good condition. A car that has more minus factors than 2. A car in very bad condition, or an accident car as it is. There are scratches or dents and repair is not needed. There are scratches or dents which can be ranked minor. There are scratches or dents and repair may be needed. There are many scratches or dents and repair is needed. Slightly dirty, and has a few cigarette burns and stains. Dirty, and has some cigarette burns, stains, and wear. Scrape which is more than A3. Scrape which is overall in the panel. A dent which is the size of a fist. A dent which is more than size B3. Major dent on the panel. A panel which has been repaired slightly, and is in good condition. A panel which has been repaired slightly, and has a slight wave. A panel which has been repaired slightly, and has a conspicuous wave. A panel which needs a replacement. A panel which has been replaced.